Sodium bicarbonate (bicarb, baking soda) is produced primarily from natural and synthetic soda ash. It has a wide variety of uses, and animal feed, food and household use, flue gas treatment, and pharmaceutical and chemical industry uses account for the largest part of its overall consumption. China was the world's largest producer and consumer of sodium bicarbonate in 2016. North America is the second-largest producing region, followed by Western Europe and other Asian countries. The leading five producers represented almost 40% of the installed sodium bicarbonate capacity in 2016; the majority of them operate several facilities in different regions. Solvay accounted for almost 20% of the total, followed by Church & Dwight (9%). Over the forecast period, capacity is expected to increase at an average annual rate of about 3%. With 24% of the global demand, China represents the single largest market for sodium bicarbonate in 2016; the rest of Asia accounts for another 17% of global demand. Europe accounts for 25% of the global consumption, while North America represents 24%. Growth in consumption of bicarb has slowed from the rapid rate seen during 2008–12. The reasons for this slower growth include reduced consumption in detergents with the switch to liquid formulations in North America and Western Europe, the near completion of replacement in flue gas treatment uses, and more recently, the slowdown of the Chinese economy. The major use of sodium bicarbonate is in animal feed, accounting for roughly one-fourth of all bicarb consumption globally. Chinese sodium bicarbonate consumption for animal feed has increased significantly, in response to the rapid growth of the feed industry caused by the rapid development of the livestock sector in China. China is currently the second-largest feed producer in the world. 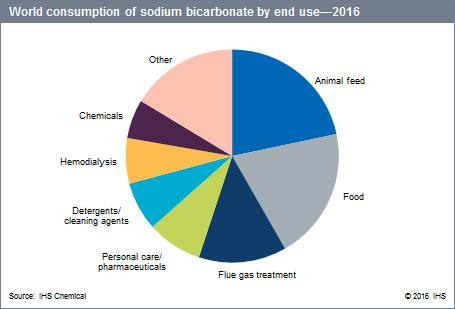 Demand for food applications accounted for about 20% of the global consumption of sodium bicarbonate in 2016, followed by flue gas treatment, personal care, detergents and cleaners, and hemodialysis. Over the forecast period to 2021, world consumption is expected to continue to increase, but at a slower growth rate of about 2% per year. The largest part of demand growth will be in Asian markets; accordingly, companies like Solvay and Novacap have reacted by investing in additional capacity in the region, mostly for specialty products.